Off and on, I struggle with stiff feet and ankles when I run. I call them my “franken-ankles” because I feel like I’m running like Frankenstein’s monster. I often see Tiffany or Teresa for massage to help increase my ankle mobility and range of motion and with my last visit with Tiffany, a flood of memories surfaced. She was working deeply on the muscles and ligaments of my foot as I was drifting when I was startled awake by a very vivid flashback of the time when I was 15 and one of the bones in my foot snapped in a freak accident on the day my mom was scheduled to have a major surgery. Because of the timing with my family, the doctors postponed casting me and my foot took a very long time to heal. It doesn’t consciously give me any issues now and I truthfully wouldn’t even remember to write that injury down on a health history, but the moment Tiffany worked around that area, I was instantly transformed 20 years back in time to that day like it was happening right then. Our bodies hold on to tension and stress in ways we can’t consciously comprehend. Many times, a client has felt a rush of emotion as their shoulders loosened up or their jaw relaxed during a massage as the stress from from a tense argument at work, or the death of a loved one starts to escape. Clients might perk up with an “a-ha!” moment when a muscle releases, revealing an old sports injury or childhood fall. 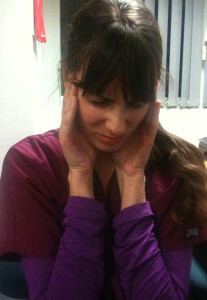 We have even experienced clients having an anxiety attack on the table as a muscle releases. Even if our minds aren’t consciously aware of all of your memories and emotions, you can be sure that your muscles are. If you happen to experience an “emotional release” during a massage, don’t be embarrassed. Chances are, your therapist has witnessed several, and many therapists have received enough massage through their schooling and self-care that they may have even experienced one themselves. If you wish to have a moment alone, that is fine. Your therapist can also offer you a tissue and a safe space to talk, laugh, or cry while they continue with the massage. They will take their cues from you. If you remember an old injury, do share! It is certainly possible it could be contributing to new pain. If you get massage all the time but never experience a rush of emotion, you are also perfectly normal! We have had clients over the years try to “force” a release, thinking hard on old traumas or forcibly breathing deeply during work because another therapist or a friend told them that it is the only way to heal, but that isn’t true! Your body knows what it needs and whatever your response to massage, you are a-ok! The article “The Body Remembers” and the sources used in the article are good reads for anyone who is curious about this topic or who may have had their own instance of “remembering” a physical or emotional trauma that their body was holding on to. While our clients LOVE having their necks and scalps massaged during massage and facials, they often complain that we leave their hair messy. 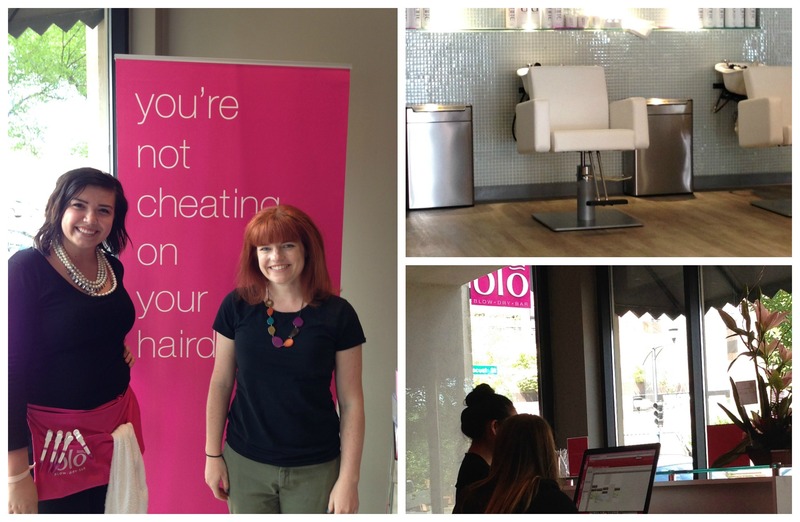 Now we have a great solution: Blo Blowdry Bar opened right across the street from us on East 6th! I tried it out myself on opening weekend, getting my hair washed and conditioned, plus a scalp massage before my blow out. 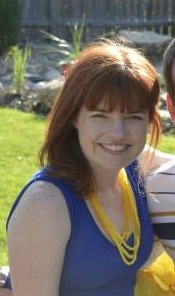 I was hoping the style would last me from Friday through my brother’s wedding on Saturday and it did! It actually still looked good on the following Monday. That was impressive! My stylist, Abbey was very sweet, actually, all of their employees were friendly. They also use Spabooker, the same system we use, so you can book your blow out online for right after your next day at East Village Spa so you’re relaxed and ready to go! Click here to learn more about Blo. 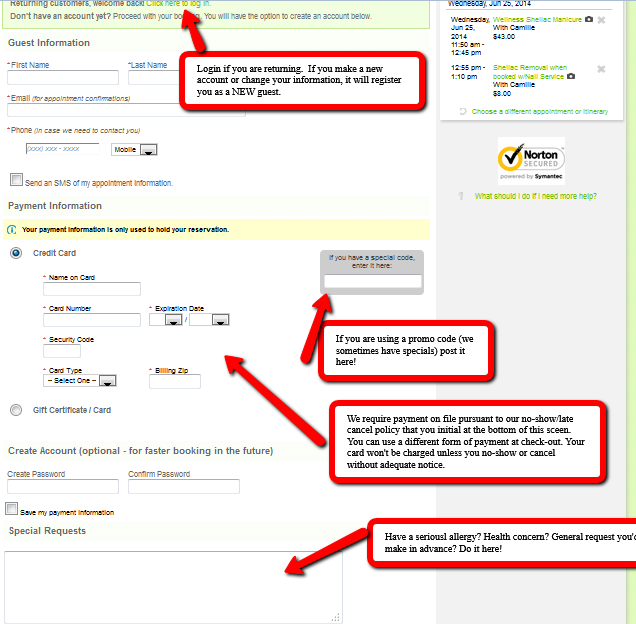 Many of our guests have the same FAQs with online booking so I thought some images would help me to explain some of the most common errors or questions in the process. Once you get the hang of it, our online scheduling system is AWESOME. 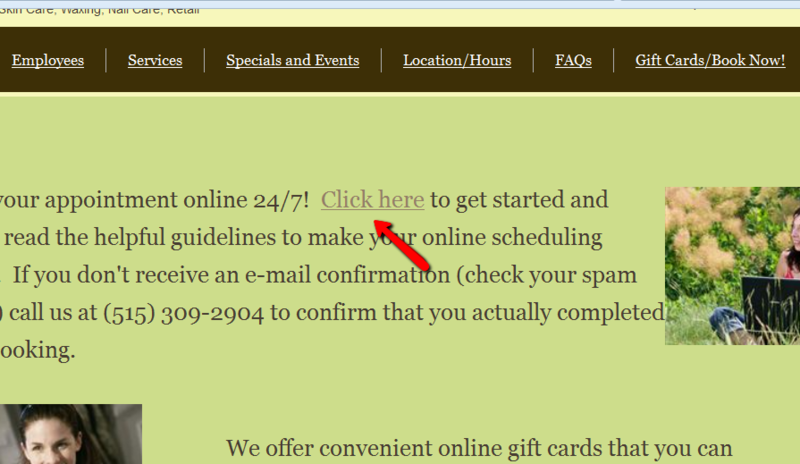 Step 1:click “Gift Cards/Book Now” in the menu bar, then once that page opens, click in the text paragraph to book your appointment. Step 3: Select the number of guests. UPDATE: As of July 2016 Booker has a new feature. 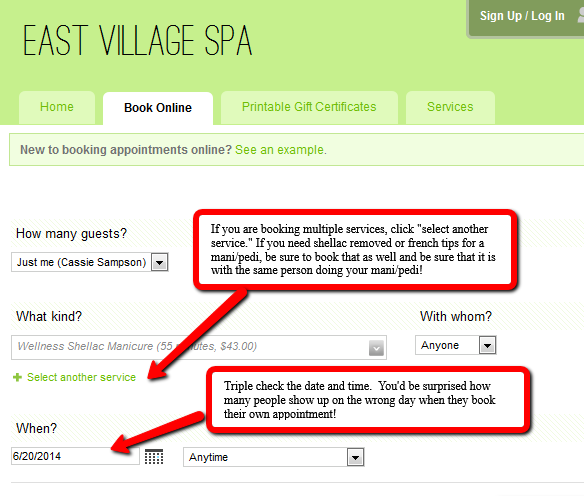 If you are booking for two guests for a couple’s massage, there is a new item in the drop down menu that states “Two Guests-A Couple” Select that for a couple’s massage. Step 4: If you don’t have a staff preference, skip this step. If you DO have a staff member you’re requesting, you need to select their name from the drop down menu or the computer can automatically reassign your appointment to another great employee to accommodate schedule changes or other guest requests. Step 5: Select your service from the drop down menu. If you are selecting more than one, click the green “Select another service” button below the menu. If you are booking a mani/pedi and want to add french tips or shellac removal, be sure to add that as another service and be sure to add it with the SAME nail tech who does your mani or pedi! Step 8: Log into your account. If you have an account but create a new one or choose not to log in, the computer will show you as a new guest. This is not the worst thing in the world, but when you arrive, our receptionists will probably ask you to do paperwork. You can clarify with them them to get your accounts merged when you arrive, but plan a couple of extra minutes if you do this as it might take a few minutes for us to sync up your accounts so your therapist can read your past notes and health history. Step 9: If you have a promo code (most likely from a facebook or newsletter special we occasionally post) enter it in the promo code box now. 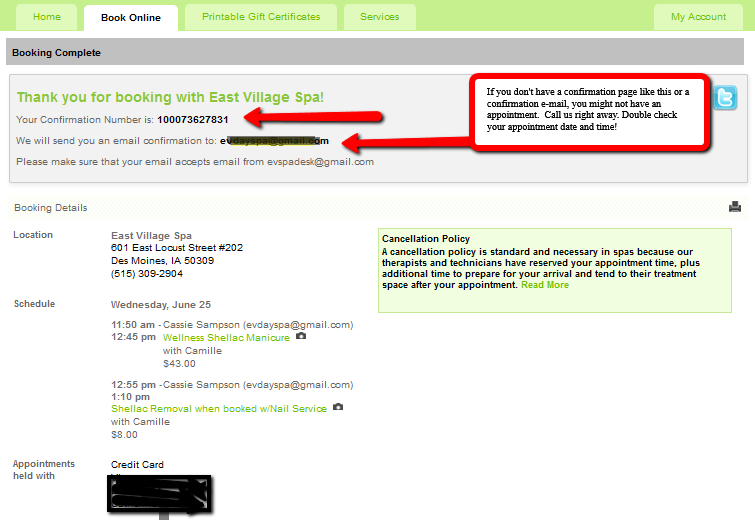 Step 10: Enter your credit card, spa gift card, or spafinder gift card number to hold your booking. This is required for our cancellation policy. (note: you will have to agree to our cancellation policy in order to schedule). You can pay with a different card, check, or cash at the time of your appointment. 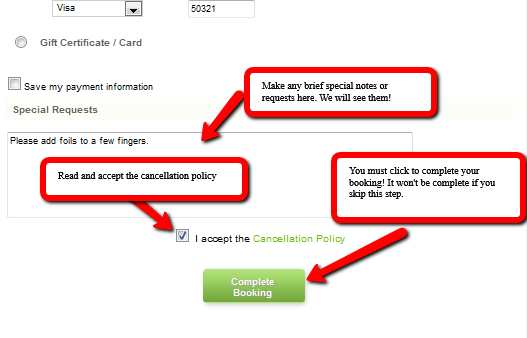 Step 12: Accept (and read) the cancellation policy. We do adhere to this policy. 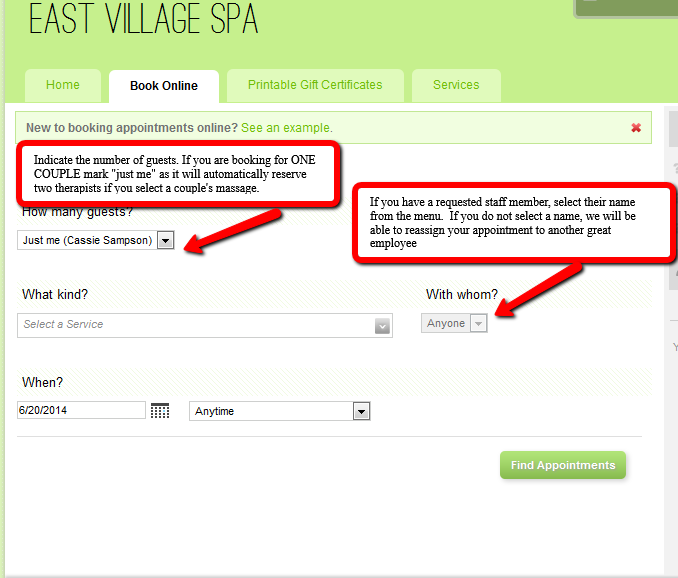 Step 14: You’ll get a “Booking Complete” screen and a confirmation e-mail. If you don’t get these, you probably didn’t finish your booking so call us right away. If your browser was chugging along and you just quit and assumed your booking went through, check your e-mail for a confirmation. Again, when in doubt, call! If you started the booking process but abandoned ship before you finished, only to try again a few minutes later, that appointment will no longer show up. Give us a call or log out and give the computer 10 minutes to free-up the appointment. You have to book AT LEAST one hour before the appointment time to give us a chance to see your booking and prepare for you. If you want in with less than an hour, call us to check availability. Remember, our schedule is constantly changing because we take bookings and cancellations over the phone at the spa as well, and our employees change schedules. If you see openings you want when you log in at 6am, don’t expect them to still be open when you log back in at 9am. If you want to book 3-4 services or for 3 or more people, we prefer you to call or shoot us an e-mail at evspadesk@gmail.com because we have more flexibility and options in scheduling that way. 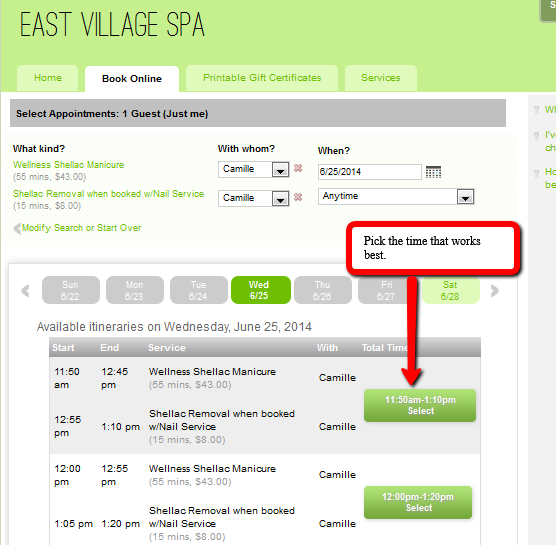 About 50% of our spa appointments are booked online and usually the system is slick, but sometimes there are glitches, whether human or computer error. If you aren’t sure how to book your appointment online, please do give us a call and we’re happy to help. Thank you for choosing East Village Spa for your services, we are truly honored to help you look and feel your best and look forward to seeing you! We’ve been getting lots of questions about the safety of spa services for pregnant women and I’m excited to share more information with you! First of all, massage therapy is a time-tested and safe way to help nurture a mom-to-be. Unfortunately, many people hear conflicting information about what is and isn’t safe and we’d like to help dispel any myths. Myth: Prenatal massage is only safe in the second and third trimester. Truth: Prenatal massage is safe throughout a healthy pregnancy. If your physician has any concerns or you are at particularly high risk, please consult with them so they can share with your massage therapist their recommendations for the best treatments. If you are having a healthy pregnancy, massage is great throughout! For a great article about the safety of massage in the first trimester, click here. Myth: Pregnancy massage should be performed with the client laying face down and her abdomen poking through a hole on the table. Truth: While many prenatal therapists do use a table or pillow positioning system that has the pregnant guest laying face-down, more and more therapists and experts are recommending the sidelying positioning for pregnant women (which we have always used) to prevent injuries to the back and uterine ligaments. Also, sidelying position allows great access to the hips, gluts, shoulders, low back, and legs, where most pregnant women complain of pain. Truth: Pregnant women have been getting foot massages from their untrained partners for ages, wearing tight shoes, and more without stimulating preterm labor. True, some forms of therapy (particularly Reflexology, Acupressure, and other Eastern techniques) do focus on points in the body that correspond to other areas of the body like the uterus and some practitioners feel that if intentional, firm, and sustained pressure is applied, those points could stimulate uterine contractions. However, for a normal foot or leg massage, this will not be the case. Your massage therapist and nail technician can give you a great foot massage (which is very helpful for feet with swelling and pain from the added weight) without lingering deliberately on those points. If you have any concerns, please talk to your massage therapist and if it helps you to rest easier, we can skip the foot massage, but truly, your poor feet deserve it and experts from the American Pregnancy Association feel it is safe. Myth: All spa services are safe for pregnant women. Truth: While most services, including modified facials, pedicures, and massage are safe and very beneficial for pregnant women, some forms of these services should be avoided including facial peels or facials that use ingredients that are not pregnancy safe (we only use the products recommended by the Derma E for pregnant women, our estheticians know which ones to avoid!) Our massage therapists will not perform heat treatments like body scrubs (lots of hot towels) or hot stone massage on pregnant women so as not to raise core temperature. The only therapists who perform our prenatal massage are those who have training and who LOVE helping our pregnant guests. We also recommend that if pregnant women want nail services, they look for nail salons who have very high safety standards and who use high quality products. For more information on the safety of prenatal massage from a trusted source, The American Pregnancy Association, click here. To schedule a prenatal service, including our Pampering Pregnancy Massage, our Pregnancy Glow Facial, or any of our manicures and pedicure, click here. The store doesn’t have a huge foot print (pun intended!) 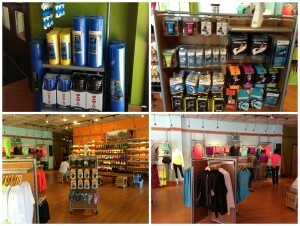 but fills their space with a good assortment of shoes, apparel (mostly Nike apparel), nutrition (including my favorite triathlon fuel, Stinger waffles, chews, and Jelly Belly Sports Beans), accessories (iphone arm bands, belts, water bottles, and such), and self care tools. 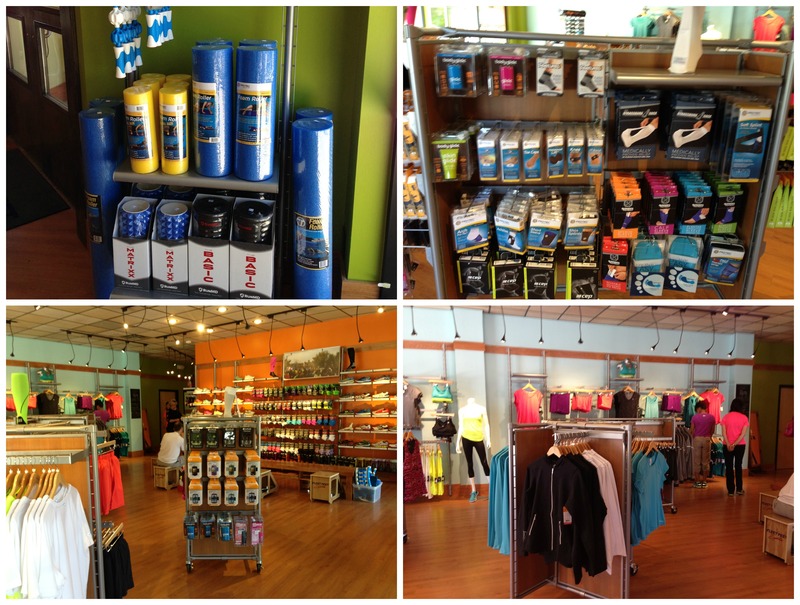 If you are new to running or walking, are looking for some cool new accessories to motivate you to go farther in your workouts, or are experiencing some pain, especially in your feet and lower body, definitely stop by their store, our employees are thrilled with the selection and we know you will be too! Last night I went crazy biking the hills in my neighborhood, my lungs were on fire and I was so focused on my training that I completely neglected the water bottle on my bike. About two hours after my ride, a nasty headache set in when I realized I hadn’t properly re-hydrated (my chocolate malt didn’t count). Days like that I wish I had a huge watermelon cut up and ready to go! For mild headaches brought on by dehydration from a crazy night out or not drinking enough water on your run, hormones, or dietary imbalances, changing up what you eat could help.This article suggests 9 foods to try to relieve headaches from many common causes. Massage therapy can also be a great relief for lots of tension-type headaches brought on by poor posture, overdoing it with chores or sports, or stress. Your therapist will focus on the common trigger points that are known to cause pain in the neck, shoulders, face, or jaw area. He or she might also recommend general relaxation massage for all-over stress relief. Do you have any proven headache remedies? Severe headaches or migraines could be a symptom of a more serious problem and might require medical attention.